Beyond Rod & Bar Aluminum: What’s Standard Aluminum Extrusion? We talk a lot about the custom aluminum profiles that we create with our clients here at Silver City Aluminum, but we also produce a wide range of standard aluminum extrusions as well. There are many different industries that use parts and products made by a standard extrusion die. From hollow aluminum tubes to the popular rod and bar aluminum, there is no limit to the number of standard shapes that can be created using the aluminum extrusion process. In fact, you might find solutions to design problems through the use of our standard profile shapes. If you have questions about the different types of standard dies available to choose from, make sure to contact one of our engineers or designers by calling the Silver City Aluminum facility in Taunton, MA. Aluminum Angles – Also known as “open dies,” aluminum angles are available in the standard extrusion category, featuring both equal and unequal structural and American standard angles. Sizes, lengths, tolerances, alloys, temper, and finish can all be custom selected by the customer to suit their specifications. 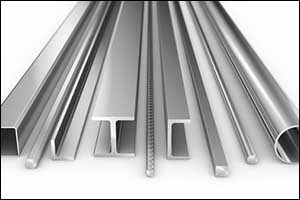 Aluminum Bars – We carry a large inventory of profiles that can be used for the production of aluminum bars. Standard aluminum extrusions can be created with square corners or round corners, depending on the needs of the customer. Customization can be requested for standard shapes, including the temper, length, finish, and the alloy that is used. Aluminum Beams – Also in the “open dies” category, extruded aluminum I-beams come in a variety of types. The most common beams that fall under this standard category include structural I-beams, American standard I-beams, and H-beams. Additional types, sizes, tempers, lengths, and finishes can also be selected based on the customer’s needs. Aluminum Channels – Structural, square corner, Aluminum Association (AA) standard, and equal thickness channels are just some of the types that fall under this category. Channel shapes are used by many different industries, including consumer goods and construction industry parts, products, and components. Like the other types of extrusions, aluminum channels can be customized in a variety of ways. Aluminum Hollows – Hollow aluminum tubes also come in a variety of shapes. They can be circles, squares, rectangular, and structural pipe, which may require a greater thickness depending on the application. These standard aluminum extrusions can be used in many different ways, including the creation of street signs, poles, lighting fixtures, and structural posts. Additional finishes can be added to increase durability and longevity. Aluminum Rods – A standard extrusion die is used to create solid aluminum rods in a wide range of sizes and lengths. Customers can specify the finish and alloy that is used, as well as the temper of the metal, to achieve the desired results. Aluminum rods are used across many different industries and can be further customized through the use of secondary operations and fabrication at our one-stop shop facility. Aluminum Tees – As the name implies, the shapes that fall under the “tees” category resemble a capital letter “T” in their design. Some of the types that fall under this category include structural, standard, ship structure, and miscellaneous. Aluminum Zees – Similar to the “tees” type of standard aluminum extrusions, the shape that is made from this standard extrusion die resembles the letter “Z” in its design. American standard zees and miscellaneous zees are available for customers to choose from in this category. If you are interested in placing an order for standard aluminum extrusions, such as aluminum tees and zees, hollow aluminum tubes, or rod and bar aluminum profiles, contact Silver City Aluminum to get a FREE estimate. Our team can assist you with your order, ensuring that you request the correct size, shape, length, and finish for your needs. If you are not interested in using a standard extrusion die and would like to learn more about custom aluminum extrusion design, give us a call at 508-824-8631. We can answer any questions that you might have about any of the services we provide. Our team of highly trained and experienced engineers and technicians can help you get the parts, products or components that you require at Silver City Aluminum in Taunton, Massachusetts.